Members of Emory’s winning team include Kristin Nelson, Rollins School of Public Health; Sarah Connolly, Laney Graduate School; Taryn McLaughlin, Laney Graduate School; Wen Liu, Emory University School of Medicine; and Christine Donorio, Laney Graduate School. Emory University won its first International Emory Global Health Case Competition since 2012 in March. Emory’s all-women team proposed the winning solution to the case, which focused on addressing an outbreak of a hypothetical infectious disease called the “FIFA virus” in Qatar prior to the 2022 World Cup. Members of this team had won the 2018 Intramural Emory Global Health Case Competition in February. The winning team’s solution involved a three-pronged approach that included detection, containment and prevention of the FIFA virus, as well as solutions for managing the legal, ethical and public relations issues resulting from the outbreak. “Our team was extremely excited about the international case subject. Three of us are really interested in infectious diseases, and the subject/solution of this case is basically part of my dream career, so I was all about it,” says Laney Graduate School student Sara Connolly, a member of Emory’s winning team and a PhD/MPH dual-degree candidate. “I think our entire team was able to shine, not just because we have an exorbitant amount of subject matter knowledge at our fingertips (both between our team members as well as connections we had with Emory faculty and people at the CDC we reached out to for further advice), but also because some of our members were truly passionate about thoroughly thinking through this problem and coming up with the very best solution,” she says. The University of Minnesota placed second, McMaster University placed third, and the University of Florida received an honorable mention award. For the first time ever, the first- and second-place teams tied for the Participants’ Choice Award – the award that non-finalist teams vote on for the best team. The University of New South Wales won the video portion of the competition, while the University of Toronto received an honorable mention award for participating in the video competition. Wayne State University also competed in the video competition, which provides an opportunity for universities on the competition’s wait list to participate. The Emory Global Health Institute has been hosting global health case competitions since 2009 and its international global health case competition since 2012. The demand for the international competition increases every year, with all 24 team slots filling up in the first four minutes of the application period for the 2018 competition. Whether a university’s team wins or loses, they often return to the competition because it provides a unique, multidisciplinary educational opportunity that helps prepare them for their future careers. “In graduate school you don’t have very many opportunities to demonstrate your ability to work effectively on a team. The case competition is a perfect way to hone those skills. It also gives you concrete examples to share when talking about soft skills that are important in the workplace, and it’s also an amazing way to become an effective presenter and public speaker,” says Taryn McLaughlin, another member of Emory’s 2018 winning team. “The content of your case strategy is important, yes, but the content between different teams can often be very similar. Learning what strategies are effective in your presentation can really give your team an edge,” notes McLaughlin, who is pursuing a PhD in microbiology and immunology through Laney Graduate School. 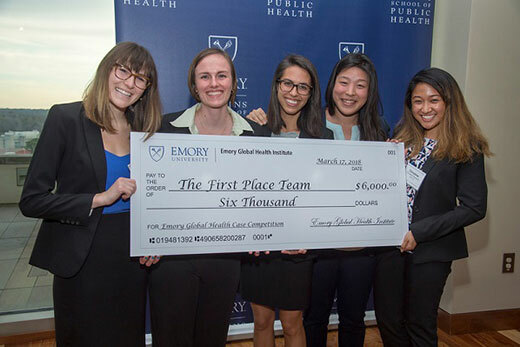 The 2019 International Emory Global Health Case Competition will take place March 16, 2019. More information on the Emory Global Health Case Competitions is available here.